What is the ViewSonic XG2703-GS? Superb monitor from ViewSonic, just far too expensive! For PC Gamers there are a few core items that are worth spending that little bit extra on to maximise your enjoyment. Once you have the gaming PC sorted, the mouse and keyboard should be next on the list. You use them all the time so it’s worth having a good one that will not hinder your gaming prowess. Same goes with the humble monitor. You stare at it all the time when using your PC, so why not invest in a decent quality one? The choice of monitors for the PC gamer has never been wider than it is today, with options ranging from just under £100 for a basic 24” gaming monitor right up to the mind bogglingly expensive 27” Asus 4K HDR G-Sync monitor at over £2,200. Yes, that’s right over £2,200 for a 27” monitor! Fortunately for those who haven’t just won the lottery, there are plenty of more affordable options whether that be gaming monitors with Freesync, G-Sync, low refresh rates, ultra-wide and much more. Released in 2016, the ViewSonic XG2703-GS is widely available for around £650-£680, it has held its price well since release but does still offer an excellent specification for the money. As with most of these gaming monitors, to achieve the maximum 165Hz refresh rate, you will need to use the display port connection as the 1.4 HDMI port is limited to 60Hz. There isn’t that much you can do with a monitor in design terms, it has a stand, a screen with a bezel and that’s it. You don’t really need it to be too flashy as you want to focus on the screen, not some garish design of the stand for example. 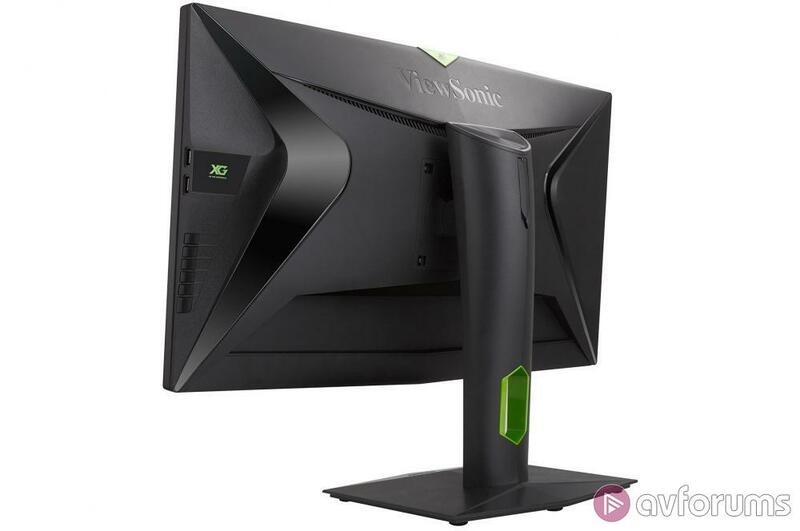 ViewSonic have kept mostly to a clean all black design but added flashes of green to the stand and lower part of the screen and to a few areas to the rear of the monitor. Just enough to stop it being a boring all black device but haven’t gone too far, although a slightly thinner bezel would always be preferred. The stand itself is compact (especially when compared to the stand holding up the behemoth that was the Acer Z35P) and allows for adjustment in all directions to ensure you achieve the perfect position. The monitor is of course VESA mount compatible and weighs just 4kg without the stand and 7kg with. Complete with the stand it measures 624mm x 532mm x 250mm. The menu control buttons are to the right of the monitor at the rear, with labels to the front to assist. It’s by no means the easiest of button layouts and we often found ourselves turning the monitor off or selecting the wrong setting by mistake. Even worse is accidentally resetting all the monitors settings, which doesn’t ask for any confirmation before doing so. We aren't sure why monitor manufacturers make it so awkward to access and adjust the settings, yes they probably want them out of sight, but there needs to be a balance. The connections are generous with 1 x USB 3.0 upstream, 2 x USB 3.0 downstream and 2 x USB 2.0 downstream along with a Display Port 1.2a, HDMI 1.4 and earphone out. All cables are included in the box to ensure you can get up and running straight away. The USB 2.0 ports are handily located on the right side of the monitor, but the USB 3.0 ports are at the back alongside the power connection, so a little difficult to easily access. To give ViewSonic credit, excluding the slightly fiddly way of accessing the menus, the menu system is one of the largest of the monitors we have reviewed recently. When bringing up the menus it almost fills to the middle half of the monitor and is of a much better resolution than we’ve seen with our recent Acer monitor reviews. The menus give initial quick access to the input select, contrast/brightness and selecting one of the game mode presets. The full menus allow for a fine detail of adjustment including colour temperature, 6-axis colour and gamma, plus the 165Hz overclocking setting and scaling mode. The final setup menu allows for altering the OSD background and timeout, plus turning off the light on the stand and recalling a memory preset. The maximum screen luminance detected was a very bright 316.3 cd/m2. Following calibration, we reduced this to a more manageable 226 cd/m2. Out of the box the monitor was already calibrated to a high level with a ColorChecker error of 2.69 and Greyscale error of 2.78. As a level of less than 3 is normally the target this would suggest no further calibration is required for the standard user. 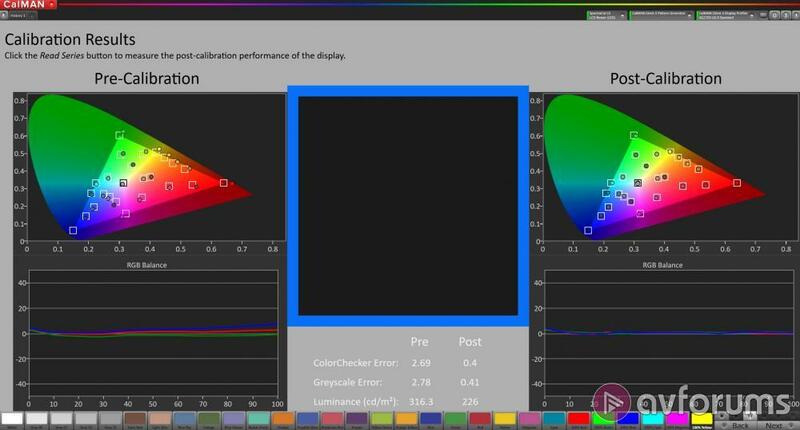 We did calibrate it anyway to see just how good this monitor might be and achieved a superb ColorChecker error of 0.4 and Greyscale error of 0.41. One of the lowest we have achieved for some time in our monitor reviews. For our testing we use a Leo Bodnar input lag tester. This measures the delay (latency) that it takes a video signal to pass from the point of input until it is displayed on the monitor. With the XG2703-GS we get a decent result of 12.2ms. A good improvement on the 16.5ms of the Predator Z1, 14.4ms of the Acer Z35P and identical to our own Acer Predator XB271HU of 12.2ms and the Dell P4317Q we reviewed previously of 10.5ms. It’s important to note that input lag is not response time. Response time is often the headline number that monitor manufacturers use in their advertising, such as ‘very low 1ms’ for example. Response time is how quickly a display can change its pixels from black to white or grey to grey. A high response time will mean you are more likely to see ghosting, which is the blurring that you see behind fast moving objects. The XG2703-GS has the same 4ms response time as we saw with the Acer Z1 and Z35P, there are monitors available with a much lower response time such as 1ms, but for general gaming 4ms should not present any issues, especially when coupled with the decent input lag result. When considering a monitor purchase, it is important to look at both the response time and input lag. The input lag is never likely to be listed in the standard specifications and particularly for gaming, a monitor with a 1ms response time but a 30ms input lag will likely offer worse performance than one with a 4ms response time and a 12ms input lag. We must admit to a certain apprehension with this monitor, brand names clearly come into play when thinking about gaming monitors, so one that you aren’t immediately familiar with is perhaps starting on the back foot. But this brand snobbishness was clearly unfounded as ViewSonic have done an excellent job here. The black levels were excellent, on par or even better in some cases with the Acer monitors along with very good contrast levels. We had no issues with the gamma curve, ghosting or colour banding at both 144Hz and 165hz settings. As this monitor uses an IPS panel, viewing angles were first-rate. Colour reproduction was superb with strong and vibrant images and very clear and crisp text. No dead or stuck pixels and no backlight bleeding of any kind. There were no complaints in any area of this monitor, it performed superbly across the board. For gaming this was of course helped by the Nvidia G-Sync module, which does unfortunately seem to add a premium of least £100 on to the monitor price. 1440P is an excellent sweet spot for those who may not have the hardware or budget to push to a 4K system but want something better than 1080P. A GTX1070 system is a perfect partner for a 1440P monitor. Should I buy the ViewSonic XG2703-GS? ViewSonic is not a brand immediately on every PC Gamer’s mind when considering a gaming monitor, but it should be. The XG2703-GS available for around £680 gives you a 27” 1440P monitor with IPS display, G-Sync, 165Hz refresh rate, 4ms response time and 12.2ms input lag along with the usual array of HDMI and Display port connection options and a generous amount of USB ports. With superb black levels, contrast and colour reproduction this monitor performed superbly across the board including a distinct lack of any issues such as with the gamma curve, ghosting or colour banding. Out of the box the monitor was already set to a good calibration level, which thanks to the extensive, if perhaps slightly fiddly menu system we were able to calibrate even further to near perfect levels. If you are looking for a 27” 1440P monitor there are a lot of alternatives available. 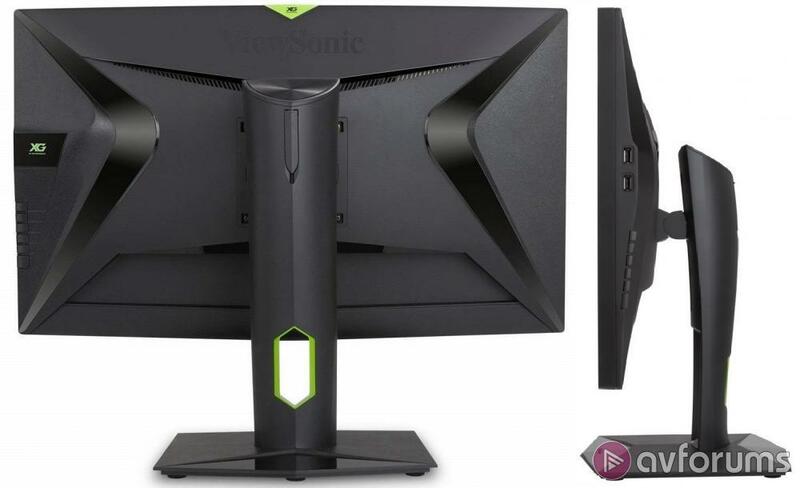 Unfortunately, whilst we found the ViewSonic to be a superb monitor and a viable alternative to the more familiar brands, due to the apparent lack of retailers selling it, the price is not competitive. For example, the identically specced Acer Predator XB271HU is only £590 or the 144Hz Dell S2716DG at £599. 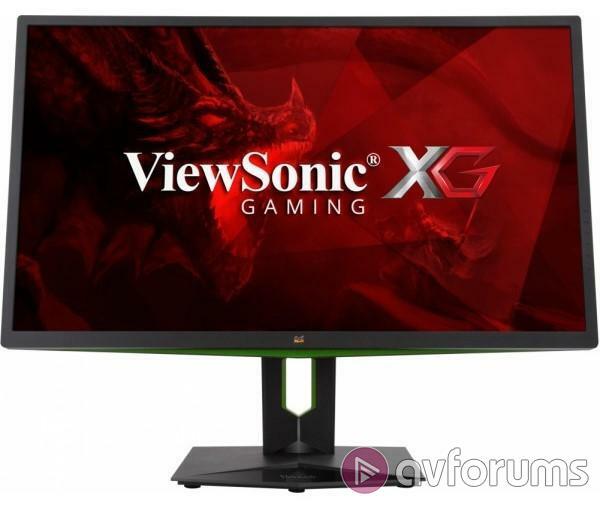 Whilst we would have loved to give the ViewSonic XG2703-GS an AVForums recommended award, we are currently unable to due to the uncompetitive price. It still is worthy of 8/10 based on specification and performance alone, but there are cheaper alternatives at this time. Write your ViewSonic XG2703-GS Monitor review.